The church wedding of President Goodluck Jonathan’s foster daughter, Inebharapu Paul on Saturday was contrary to expectations attended by former President Olusegun Obasanjo at the National Christian Centre, Abuja. The former president has been criticizing Jonathan’s administration in the past few months. Obasanjo, who arrived the venue with Dr. Andy Uba and some other aides before the commencement of the service, was ushered into the hall amidst standing ovation by his admirers. He took his seat at the VIP section while his introduction during the service attracted a loud applause from the congregation. 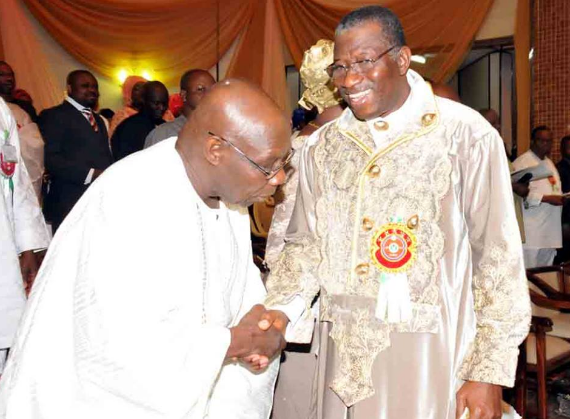 President Jonathan also recognised Obasanjo’s presence while giving the vote of thanks at the church service. At the occasion, the President also urged the couple to embrace the virtue of endurance and learn to resolve their disagreements in their bedroom. Jonathan asked them not to bring their problems to him because he has more than enough issues to handle. Though it was not a Sunday, Dr Alex Ekwueme, former Vice President, who had a scheduled interview appointment, took The Sun team to his chapel, a sanctuary in the upper chamber of the right wing of his house.He had led the way from his living room to climb the staircase to the chapel, explain­ing that it was the only place the interview could be held without much distraction from visitors.After we had ascended the ‘holy’ up­per chamber, we began the business of the day that lasted for about two hours, with the octogenarian looking at the country, remembering what had happened as if they occurred just yesterday, appraising power equations from independence in 1960 till now. Dr Ekwueme, who co-founded the Peo­ples Democratic Party (PDP) with some other illustrious Nigerians, also looked at the current state of the party, saying that things have fallen apart in the PDP envi­sioned to be a mass movement that would rule the country for 60 years.He also told the story of how the party has derailed from the original vision of the founders, and how the leadership has aban­doned him. An Ethiopian Airways cargo plane from traveling from Lome, Togo to neighboring Accra, Ghana is said to have crash-landed at the Kotoka International Airport in Accra. Eyewitness accounts say the plane skidded off the runway in the process of landing at about 10:00 am local time on Saturday. All three crew members said to have been on board cargo plane flight no. ETEQV survived the incident and are currently receiving treatment at the 37 Military Hospital in Accra. Bad weather is thought to have contributed to the crash landing incident although Ghanaian authorities have not confirmed this. Ethiopian Airlines is top rated in Africa and has one of the continent's best airline accident records. As of January 2014, the Aviation Safety Network has recorded 60 accidents/incidents totalling 322 fatalities since 1965. The bus was on fire at the time of filling this report. However, witnesses said the driver of the bus escaped unhurt. It is not clear what led to the attack. Police could not be immediately reached for comments. A witness, whose car was also torched by the rampaging mob, said another PDP-branded car was also set alight. The source, who only identified herself as Mrs. Rose, told PREMIUM TIMES that her Honda car was also smashed by the protesting youth. South-Easterners will deliver 100 percent block vote to the PDP in February general elections. divisiveness and violence is a vexatious stigma that makes support for it a cardinal sin among the peace loving people of the zone”. SENATOR Chris Ngige, representing Anambra Central Senatorial District, has predicted that the All Progressives Congress (APC) will win 28 states on first ballot in February general elections. Ngige told newsmen in Awka on Thursday that his prediction was based on facts and surveys conducted by independent surveyors. Ngige, who is the Coordinator of General Muhammed Buhari Presidential Campaign in the South-East, said that following the prediction, APC would form the next government at the centre. “Our party will win in 28 states in the first ballot; we have done everything humanly possible to educate our people to follow this change. “We have done very well in making the people believe in APC despite the vilification by the PDP,” he said. Ekiti State Governor, Mr. Ayodele Fayose, has described the All Progressives Congress as capable of causing chaos in Nigeria with the statements being made by its leadership. He said this could trigger crisis in the Niger-Delta area of the country in the South-South, where President Goodluck Jonathan of the Peoples Democratic Party hails from. Buhari, on the other hand, is from the North-Western part of the country. Jonathan, Buhari and 11 other candidates will vie for the presidential seat at the polls in February, 2014. 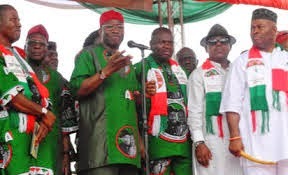 OUK,THE ABIA NORTH SENATE RACE AND THE JONATHAN FOR LIFE SLOGAN! Like I earlier stated,a lot of lies has been told to us about this one true Igbo leader by a man who's wickedness can only be equated by that of Pharaoh of Egypt and deception,that of our yesteryears story book about tortoise. I have met with most of our Igbo ex-Governors,non has the after office follower-ship as Dr. Orji Uzor Kalu! From my first port of call which was in his multi-million dollars mansion home in the Presidential Villa,where I was stunned by the crowd I met and was later meant to understand that they were old members of the National Assembly and some were His old colleagues. Saudi Arabia has lashed a liberal blogger 50 times in public, despite widespread international outrage and calls for clemency from human right groups. President Goodluck Jonathan Friday in Enugu challenged the presidential candidate of the opposition All Progressives Congress, Muhammadu Buhari to unveil his blueprint on how to fight corruption and 'revive' the nation's economy, noting that unlike in 1983 when Buhari clamped "innocent Nigerians" into jail, there are new and modern ways of fighting corruption. Addressing the mammoth crowd of supporters who thronged the main bowl of Nnamdi Azikiwe stadium, Enugu, venue of the PDP presidential campaign rally, Jonathan said his administration had tackled the problem of corruption in the last four years using modern technologies. "People keep accusing us of being corrupt, let them bear in mind that no nation can thrive with corruption. 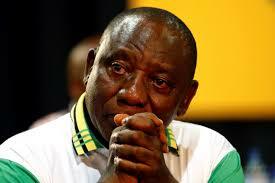 We hate corruption but the issue now is that they have not told us how to deal with it. They should show us how they will manage the economy better than us. Let them unveil their blueprint," he said. In his exalted spirit, he is pointing the way toward a glorious Nigerian destiny where there would be power stability, elimination of Boko Haram, job creation, zero tolerance for corruption and the like. Will Mr. Jonathan be able to achieve these, even if he tarries on to 2019? To think of it, is it actually useless to speak guilt of a man who in the bottom of his heart is devoted to his nation with studious love, and who only missed or failed to understand the common road to her destination? Top shots of the Peoples Democratic Party (PDP) in Abuja and Anambra State are manipulating the judiciary in order to achieve their imposition of a disgraced former Aviation Minister Stella Oduah as one of the party’s senatorial candidates in Anambra. Aggrieved members of the party named Pius Anyim, the Secretary to the Government of the Federation, as the key collaborator in Ms. Oduah’s game to be foisted as a senatorial candidate. “Senator Anyim and Chief Mrs. Oduah have been working together to undermine internal democracy in Anambra PDP,” one of several sources in the state alleged. “They appointed an illegal caretaker committee led by Major General Aliyu Karma (ret. ), as chairman, and Alhaji Dalhatu Akibu, as secretary, to oversee, run the affairs and conduct elections for the PDP, Anambra State chapter,” the source added. Several party members said the imposition of the Karma-led committee flouted two court judgments, an interim order issued in October 2014 by Justice E. S. Chukwu of the Federal High Court Abuja, and an earlier interlocutory Injunction by Justice H. A. Nganjiwa of the Federal High Court. In the latter verdict, Justice Nganjiwa ordered both the PDP and INEC to recognize and deal with Ejike Oguebego as the party’s state chairman in all election matters in Anambra State pending the determination of the substantive lawsuit. As the build-up to the February Presidential elections gathers momentum, Ondo State Governor, Olusegun Mimiko, says Nigerians will not accept any President who has anything less than a university degree. He disclosed this while speaking at the official flag-off of the Presidential campaign for the Peoples Democratic Party (PDP) candidate, President Goodluck Jonathan, yesterday at the Tafawa Balewa Square, Lagos. He said the people of the South West have concluded plans to rally support for the PDP candidate adding that anyone who would become the president should be a university degree holder. others, we will not settle for a President with less than a University degree”, he declared. The Governor described the president as a democrat noting that in spite of challenges and abuses on his person, Jonathan had remained committed to the unity of the country. TheYouth Council of the apex Igbo socio-cultural organisation, Ohaneze Ndigbo on Wednesday carpeted the fiery Enugu Catholic priest, Rev. Father Ejike Mbaka, for his recent advice to Nigerians to reject President Jonathan in the coming election because of alleged non-performance. Describing his remarks as “spiritual poison” unbecoming of a religious leader, the National President of the Ohaneze Youth Council, Mazi Okechukwu Isiguzoro, urged Nigerians, especially Ndigbo, to ignore the vituperations of the Catholic priest as he was not speaking for either the Catholic Church or Ndigbo. Have you been wondering why our amiable president was named Goodluck? The answer has been revealed in his authorized biography..According to his mother, Madam Eunice Aye Jonathan....“Madam Eunice recalls that there was nothing special about the day on which Goodluck was born in Otuoke. His birth was however very easy compared to her other experiences with childbirth. She recalled, “I often had prolonged labour during childbirth, sometimes for up to a wee, and because of this, I usually had still-births. But when it was the turn of Goodluck, I delivered him the very day I started having labour pains. This surprised me”. The list includes ten chart-topping videos that stayed on the number one spot for many weeks during the course of the year. Runtown’s Gallardo holds the number one spot followed by Davido’s Aye and Dr Sid’s Surulere on numbers two and three respectively. Other videos that made the list include Jaiye Jaiye, Show you the money andYawa dey. The Peoples Democratic Party (PDP) members are determined to ruffle the Anambra state Governor , Chief Willie Obiano in his strongholds. This is because the party has extended its campaign rally to Anambra West Local Government Area of the state, which is one of the strong holds of the State governor, Chief Willie Obiano of All Progressive Grand Alliance (APGA). Report has it that the immediate past governorship candidate in the 20`3 governorship election, Comrade Tony Nwoye while addressing over 6,000 party loyalists said that PDP remains the only way forward for national transformation and progress even as he added that the transformation agenda of Mr President and its achievements had already made PDP a household choice among Nigerians. When the popular music producer, Babatunde Okungbowa a.k.a OJB was down with kidney related disease, and consequently was flown to India for a transplant, two things pre-occupied his mind. They were, the fear of the unknown and that of the mystery of death. But in the mix of these depressing thoughts, OJB did not give up the hope of cheating death. He went through the surgeon’s knife and came off successfully. Today, the popular music producer is not only bubbling with life again, but he’s championing a worthy cause geared towards affecting the lives of those who are suffering from kidney related diseases. It would be recalled that shortly after his return to the country, OJB set up a foundation called, OJB Foundation, which he is using to solicit support for those suffering from kidney related diseases. He stated that the foundation would majorly act as a dialysis centre, providing financial relief for patients who spend their life savings on undergoing weekly dialysis. Nigerians even Lagosians witnessed an unprecedented turn out, in the maiden of President Goodluck and vice President Namadi Sambo presidential rally, held at the Tafawa Balewa Square, Onikan Lagos. See the full pictures that summarized the epoch making event. Mary Adufe is a fast rising actress in the Yoruba movie industry. She studied communication and language at the Obafemi Awolowo university, Ife and later worked as a journalist for a while. She resigned to become secretary to popular Yoruba actor Yinka Quadri . She has featured in so many soap operas and Nollywood movies like Ona Abayo, Effisy po, Ifokantan, Nitori Aye and many more. In this interview with Aderonke Adeyeri, she talks about her passion for acting and other interesting things. Excerpts. Winner as the single is titled, flamboyantly displayed Debie’s energy, passion, love and enthusiasm for music as indeed a winner and not a loser. Debie Rise who had stunned with ‘Gagabu’ and ‘MatchUp’ is gradually catching attention, earning respect of critics and getting a lot of gigs across the nation. Of particular mention are her performances at the Pepsi Gala Nite and several private ‘end of the year’ parties. Ivory Coast and Manchester City of England play maker, Yaya Toure has claimed the 2014 Glo-CAF African Footballer of the Year award, thus winn-ing it for the fourth straight time, since 2011. The Ivorian midfielder who is 1.88 meters tall was born in Bouake in May, 1983. 140 with over 39 goals. The Ivorian captain defeated his nearest rival, Nigeria captain and first choice goalkeeper, Vincent Enyeama and Gabon international, Pierre-Emerick Aubameyang. The Movement for the Emancipation of the Niger Delta, MEND, may have been hit by a crisis, following the purported endorsement of General Muhamadu Buhari (rtd) of the All Progressives Congress, APC, for the presidential election, as a former leader of the group, ‘Gen’ Reuben Wilson, has called on Nigerians to disregard the said endorsement. He said that the ex-militants were all for President Goodluck Jonathan in next month’s presidential election. But Jomo Gbomo, who speaks for the group, has lambasted the Peoples Democratic Party, PDP, and Ijaw Youth Congress, IYC, for questioning its credibility and describing MEND as a ghost organisation because of its proclaimed support for Buhari. President Goodluck Jonathan, yesterday, flagged off his campaign for re-election with a declaration that his generation has failed Nigeria. While addressing youths at the campaign ground, the President told them to work for the future of Nigeria, through hard work and dedication, adding that the youths are the ones to take the country to the moon. Sri Lanka’s Mahinda Rajapakse has conceded defeat in presidential elections, officials said Friday, after a bitter campaign that saw Asia’s longest-serving leader brought down by allegations of corruption and a failure to bring about post-war reconciliation. 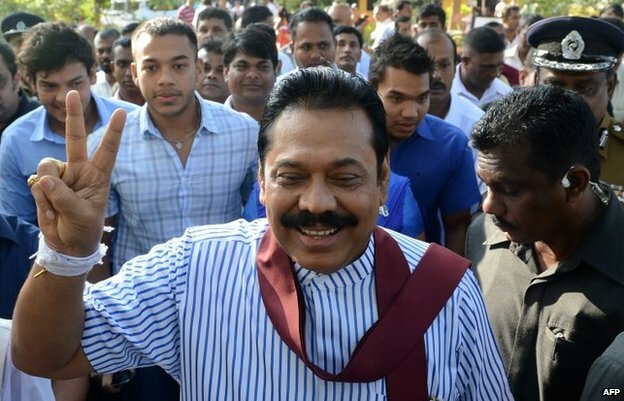 After the island’s tightest presidential vote in decades, a top aide to Rajapakse said the one-time strongman accepted the decision of voters who turned out in force on Thursday. “The president concedes defeat and will ensure a smooth transition of power, bowing to the wishes of the people,” presidential press secretary Vijayananda Herath told AFP, adding that he had already vacated his main official residence in a symbolic gesture of defeat. In what may be described as the biggest catch of the new year, the Economic and Financial Crimes Commission, EFCC, has smashed a syndicate of suspected fraudsters who duped their victims, within and outside Nigeria, over N300million in cases involving different fake crude oil deals. Two members of the syndicate, Michael Oghenemi Morowie and Emmanuel Owoicho, are currently in the custody of EFCC, explaining their involvement in the alleged crude oil scam. EFCC moved against the syndicate following complainants by victims, who have been fleeced by the alleged fraudsters who operate, using different pseudo names and companies. An unsuspecting victim alleged that members of the syndicate collected the sum of N119million from him in the pretext of supplying him two million barrels of Bonny Light Crude Oil. The Governor of Anambra State Chief Willie Obiano has on behalf of the government of Anambra state expressed profound appreciation to Ndi Anambra for the peaceful and memorable Christmas and New Year celebrations witnessed in various communities in the state. The governor was particularly impressed by the enthusiasm and sense of duty displayed by Ndi Anambra through their positive response, attendance and participation in the activities and programmes of the maiden Anambra Heritage Festival which held from December 23 to 26, 2014. The Festival activities include Reading by Novelist and Newspaper Columnist, Prof. Okey Ndibe, Masquerade display at Ekweme Square, the Obiano Football Fiesta and the Jam Blast Music show held at the Ekwueme Square on the December 26, 2014. President Goodluck Jonathan, Thursday, dismissed the alleged endorsement of the Presidential Candidate of the All Progressive Congress, General Mohammadu Buhari by the Movement for the emancipation of Niger Delta, saying that no person who mean well for the country should be excited by the endorsement of a terrorist organisation. In a statement by the Special Adviser to the President on Media and Publicity, Dr Reuben Abati, he noted that for a faction of MEND that had attacked venues where the President was presiding over events at least two times, the attack on the person of the President did not come as a surprise. President Jonathan therefore advised General Mohammadu Buhari not to “place any stock on his purported endorsement by the renegade faction of MEND which is led by a convicted and unrepentant terrorist with whom no leader who truly means well for Nigeria should be associated”. Chairman of the Independent National Electoral Commission, INEC, Professor Attahiru Jega, has promised that every eligible Nigerian would be provided with his or her Permanent Voters’ Card, PVC, before the general elections next month. Jega was responding to a request by President Goodluck Jonathan for INEC to ensure that every Nigerian, who registered to vote was provided with PVC to enable him or her vote in the elections. Meanwhile, the House of Representatives Committee on Electoral Matters has invited the INEC and other stakeholders to deliberate on the country’s readiness to conduct 2015 general elections. Jonathan spoke while swearing in a new National INEC Commissioner representing Oyo State, Prof. Akinola Murtala Salau, saying no Nigerian should be disenfranchised because of his/her inability to get the PVC. The President said the level of interest shown by Nigerians from all walks of life in getting their PVC was an indication that confidence was being restored in the electoral process. The governor of Anambra State, Chief Willie Obiano has condoled with President Goodluck Jonathan on the passage of his sister, Mrs. Nancy Jonathan-Olei who recently died at the age of 53.In a statement signed by James Eze, his Senior Special Assistant on Media, Governor Obiano expressed a deep sense of regret that the late Mrs. Jonathan-Olei passed on at a very young age, describing her death as colossal loss to her family and the nation. “We are gathered here today to open up the floodgates of our national memory and spare some thoughts on the numerous sacrifices that the members of the Nigerian Armed Forces have made to protect our freedom and preserve our nationhood”. These were the striking words of the governor of Anambra State, Chief Willie Obiano at a special ceremony held yesterday to launch the sale of emblem to mark the 2015 Armed Forces Remembrance Day at the Conference Hall, Government House, Awka. Behaviour Change Can stoicism make you happier? The Oyo State police command on Wednesday impounded a lorry conveying ballot boxes said to belong to the Independent National Electoral Commission around 2am in the Yemetu area of Ibadan. The ballot boxes were stored in a 40-feet container. Sources said that the trailer was arrested on the suspicion that it was carrying contraband items but was later discovered that its contents were ballot boxes meant for the next month election in Osun State. It was learnt that the trailer and the consignment were later released after police investigation revealed that the boxes were being transported to Osun State by INEC. However, the arrest created anxiety in political circles as politicians made effort to know if the boxes were empty or stuffed with ballot papers. At a point, rumour spread in the city that a certain political party had connived with INEC to bring in thumb-printed ballot papers into Oyo State. The Oba of Lagos, Oba Railwan Akinolu, on Thursday said that President Goodluck Jonathan should not be blamed for the problems of Nigeria. Akiolu said this while receiving Jonathan at his palace in Lagos. NAN reports that the President was in Lagos State for the flag-off of the Peoples Democratic Party (PDP’s) presidential campaign at the Tafawa Balewa Square. He was in the Oba’s palace to pay homage to him and seek his blessings before going to the campaign venue. The above subject caption was the title of the weekly treatise from Prof. Niyi Akinnaso in his regular column, “Thinking with You”, which appeared in The PUNCH of Tuesday, January 6, 2015. Earlier, an advert announcement with the picture of the Senate Building of the Ondo State University, Akungba Akoko and the subsequent reporting of the project inauguration had captured and directed my attention to the said Senate Building. I must admit that the picture I saw in that advert was fascinating and good to behold. He said such politicians could not be described as statesmen because of the big offices they occupied before but by virtue of what they brought to bear on the nation. Jonathan spoke while playing host to a delegation of the Tanko-Yakasai-led Northern Elders Council in the Presidential Villa, Abuja. Although the President did not mention names, former President Olusegun Obasanjo had on Monday said Nigeria was facing economic problems due to the failure of the present administration to plan for a rainy day. In his sermon in Lagos on Sunday, Pastor Bakare asserted that 2011, the church was entangled in a bribery web, as some pastors were heavily paid by the President Goodluck Jonathan team to mobilize Christians through different means, and that they delivered for him. It would be recalled that ahead of that election, President Jonathan appeared at the Redemption Camp of the Redeemed Christian Church of God (RCCG) on the Lagos-Ibadan Expressway, where he was widely photographed kneeling down in prayer before Pastor Enoch Adejare Adeboye, the General verseer. There appears to be a great anxiety by somes to assert and spread wrong conclusions arising from my two previous notes on the education of General Buhari. I have not said General Buhari did not attend Primary or Secondary Schools. He did. What I said and stand on, is that section 131(d) of the Nigerian 1999 Constitution focuses not on certificates but on education. I repeat, for the avoidance of doubt, a certificate where available may well prove the education level of the citizen desirous of becoming President, but without it, he can still meet the education qualification by other modes of proof. General Buhari met that proof before the eminent men and woman of the APC Screening Committee (A.S.C) He did that by affidavit evidence under oath and by interaction and reaction. The Screening Committee justly and rightly concluded that “he has been educated up to at least school certificate level or equivalent. The Movement for the Emancipation of the Niger Delta (MEND) has countered the Ijaw Youth Council, the Peoples Democratic Party and other ex-militants in the Niger Delta region over its support for the candidature of the Presidential candidate of the All Progressives Congress (APC), Muhammadu Buhari. The Movement for the Emancipation of the Niger Delta (MEND) views the recent question and statement credited to the Peoples Democratic Party (PDP) National Publicity Secretary, Olisa Metuh, as very callous and irresponsible. This question: “Explain your connections with MEND”, further confirms and vindicates our views about Goodluck Jonathan, his inept government and the PDP. The Lagos State governorship candidate of the Peoples Democratic Party, Mr. Jimi Agbaje, has warned that if President Goodluck Jonathan fails to win next month’s election, the South-South could shut down the oil sector and this would affect the nation’s economy which is oil-dependent.Agbaje, however, asked that if another part of the country shuts down over the failure of its candidate emerging President, would it have an equal effect on the economy since Nigeria relies heavily on the Niger Delta for its foreign exchange earnings. Jonathan hails from the South-South while his major contender, Maj. Gen Muhammadu Buhari (retd.) of the All Progressives Congress, hails from the North-West. The PDP governorship candidate said this at meeting in London organised by his supporters and the UK chapter of the PDP. In the six-minute video clip posted on DiasporaPr.com, which was sighted by our correspondent, Agbaje warned that Jonathan’s victory was imperative. A police corporal, Funmilayo Balogun, has been arrested for stealing a Honda Accord car worth N5 million​,​ which she sold to unsuspecting client. The 35-year-old suspect was on Wednesday paraded by the Ogun State Police Command. She was wearing a police uniform with the rank of Assistant Superintendent of Police. She was dismissed in 2010 by the Ondo State Command for presenting fake result to get police employment. The suspect allegedly committed the offence in October 2014, when she approached a car dealer in Oke-Ilewo area of Abeokuta on the pretense that she wanted to buy the car. An attempt by the Katsina State Urban and Regional Planning Board, KURPB, to stop further work on a branch of ECWA Church in Matazu Local Government Area has generated tension among residents, setting off fears of a possible religious crisis. In a letter, dated January 6 2015, entitled “STOP NOTICE” and received by ECWA Trustees, KURPB gave the church a three-day ultimatum to stop all the development work at Matazu ECWA church. KURPB said that ECWA had been proceeding with the development of the church without necessary legal requirements, but said the church might forward proper formal application or risk “further action” by the board. The letter reads: “You are hereby advised to stop all the development work at Matazu ECWA Church. It is believed that you are proceeding with development of the site without the necessary legal requirements of planning permission from Katsina State Urban and Regional Planning Board or in violation of such permission. COLUMNS, KALU LEADERSHIP SERIES: WHAT COLOUR IS 2015? This is the season of predictions and prophecies. They come from different quarters, each purveying one message or an­other – some favourable, some fearful. In all, these predictions and prophe­cies help to shape our future and serve as a compass to that which is yet to come. And 2015 is not going to be dif­ferent. But the question on every lip is: what colour is 2015? What hope or failure does it hold for our dear nation and its people? In our clime, people treat these predic­tions and prophecies differently. While some people underrate them and treat them with disdain, some others take them seriously. The reasons the two schools of thought behave the way they do vary and depend on the idiosyncrasies of each. Mr Rajapaksa, in office since 2005, called the election two years early with analysts predicting an easy win. But many voters have since rallied behind the challenger, former health minister Maithripala Sirisena. Mr Rajapaksa rode a wave of popularity after the civil war ended in 2009 but he now faces claims of cronyism. Analysts say Mr Sirisena appears to have capitalised on this perception, making gains among Sinhalese who usually vote for Mr Rajapaksa. Mr Sirisena is also expected to win most of the vote from the ethnic minorities that make up about 30% of Sri Lanka's population. 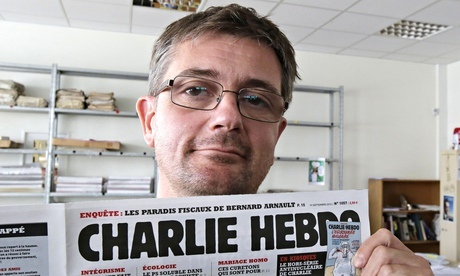 Charbonnier had been editor of Charlie Hebdo since 2009 and led the paper’s charge against the taboo on depicting the prophet Muhammad, in the name of freedom of expression. He had been under police protection since November 2011, when the satirical weekly published a special edition mocking the prophet and Islam, and a firebomb attack destroyed the paper’s offices. e was a well-known cartoonist who had previously worked for the Franco-Belgian comic magazines L’Echo des Savanes and Fluide Glacial, as well as the communist daily Humanité. In 2012, following a further controversy over the magazine’s depiction of Muhammad, Charbonnier told the avant-garde magazine Tel Quel: “I’m not scared of reprisals. I don’t have kids or a wife, I’ve got no car, no credit. The French president, François Hollande, has led a minute’s silence for the victims of Wednesday’s attack on the offices of satirical magazine Charlie Hebdo, as police responded to unconfirmed sightings of the suspects north-east of Paris amid an atmosphere of heightened tension and confusion. 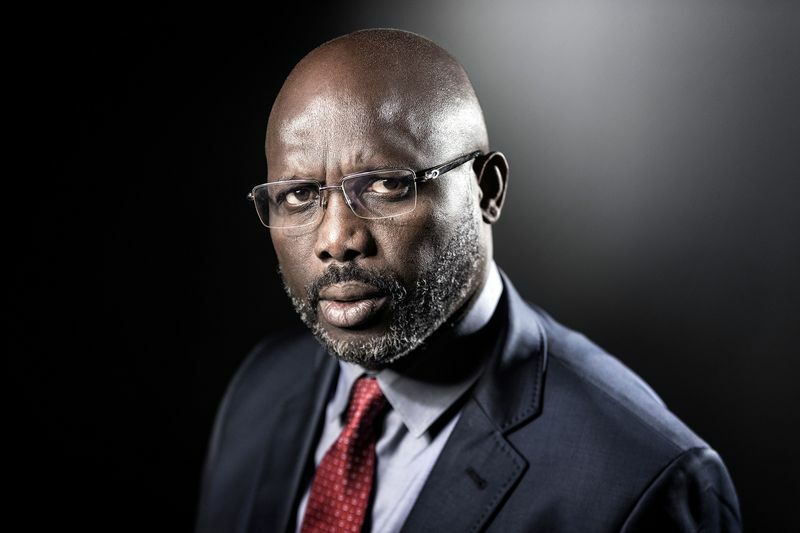 In a briefing on Thursday morning, Bernard Cazeneuve, France’s interior minister, said that seven arrests were made overnight, but the two main suspects, brothers Saïd and Chérif Kouachi, were still at large. With the search for the gunmen in its second day, anti-terror police converged on the Aisne region of north-east France after unconfirmed, and at times confusing, reports that the suspects had been seen. 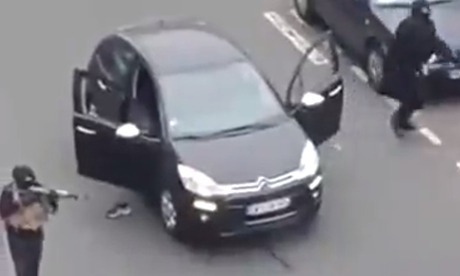 Two police sources told Reuters the men were seen armed and wearing cagoules in a Renault Clio car at a petrol station on a secondary road in Villers-Cotterêts, about 70km (40 miles) from the French capital. Bruno Fortier, the mayor of nearby Crépy-en-Valois, said helicopters were circling his town and police and anti-terrorism forces were deploying en masse. “It’s an incessant waltz of police cars and trucks,” he told Reuters. Who will stop this looting spree? Ballot and blood? Never again!